In 2016, I dipped my toes into exploring the strange trend of wine aged in whiskey barrels with my original Whiskey and Wine post. In that post, I did a blind tasting featuring 3 barrel aged wines and one regular red wine ringer thrown in. While I thought this fad would quickly fade, it looks like it has only picked up steam with new entries on the market. 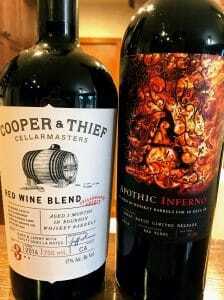 I got bottles of the Apothic Inferno, Robert Mondavi Cabernet Sauvignon and Barrelhouse Red featured in the last blind tasting as well as new bottlings from Mondavi of a bourbon barrel aged Chardonnay (I’m not kidding) and a Cabernet Sauvignon from Barrelhouse. I found further examples from Cooper & Thief, 1000 Stories, Big Six Wines, Stave & Steel and Paso Ranches. 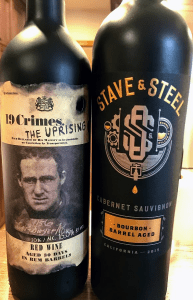 For a twist, I also added the 19 Crimes The Uprising that was aged in rum barrels. 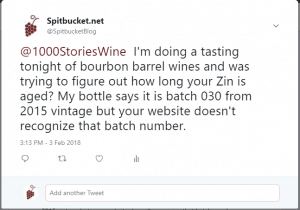 I tried to find bottles of The Federalist’s Bourbon barrel aged Zinfandel, Jacob’s Creek Double Barrel Cabernet Sauvignon and Shiraz and 1000 Stories “half batch” Petite Sirah but to no avail. Why are so many producers jumping on this bandwagon? On Twitter, wine and lifestyle blogger Duane Pemberton (@Winefoot) had an interesting take. Not just a marketing gimmick – but a great way to mask the flaws of sub-standard fruit. It’s like putting lipstick on a pig.. it’s still a pig..
A similar sentiment was shared on Facebook from one of my winemaking friends, Alan, who noted that the charcoal from the heavy toast of the bourbon barrels could function as a fining agent for wines with quality issues like bad odors. Now considering that many of the mega-corporations behind these wines like Gallo (Apothic), Constellation Brands (Mondavi & Cooper & Thief), The Wine Group (Stave & Steel) and Concha y Toro/Fetzer (1000 Stories) process millions of tons of grapes for huge portfolios of brands, this actually makes brilliant business sense. Even in the very best of vintages, you are always going to have some fruit that is less than stellar–often from massively over-cropped vineyards that aren’t planted in ideal terroir. Rather than funnel that fruit to some of your discount brands like Gallo’s Barefoot, Constellation’s Vendange and The Wine Group’s Almaden, you can put these wines in a whiskey barrel for a couple of months and charge a $5-10 premium–or in the case of Cooper & Thief, $30 a bottle! In this tasting, I wanted to explore how much of the whiskey barrel influence is noticeable in the wine. 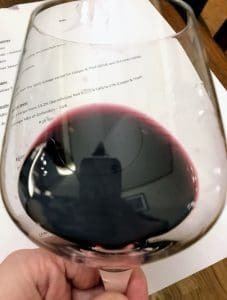 In the last blind tasting, one of the things that jumped out for me is that the Mondavi Cab and Barrelhouse red didn’t come across as “Whiskey-like” and were drinkable just fine as bold red wines. Meanwhile, the Apothic Inferno did scream WHISKEY but it came across more like a painful screech. Larceny — From Heaven Hill Distillery. A “fruity sweet” Bourbon with noticeable oak spice. Jim Beam — Old standard from Beam-Suntory. A light Bourbon with floral and spice notes. Two Stars — A wheated Bourbon from Sazerac. It’s kind of like if Buffalo Trace and Maker’s Mark had a baby, this would be it. Caramel and spice with honey and fruit. Bulleit — Made now at Four Roses Distillery. Sweet vanilla and citrus. Made by Constellation under the helm of Jeff Kasavan, the former director of winemaking for Vendange. I did appreciate that this was the only red blend that gave its blend composition with 38% Merlot, 37% Syrah, 11% Zinfandel, 7% Petite Sirah, 4% Cabernet Sauvignon and 3% “other red grapes.” The wine was aged for 90 days and had the highest ABV of all the wines tasted with 17%. This wine was also unique in that it was from the 2014 vintage while all the other reds (except for the 19 Crimes) were from the 2015 vintage. Made by Bruce and Kim Cunningham of AW Direct. A Cabernet Sauvignon and unknown Red Blend aged 90 days in bourbon barrels. Both of these wines were unique in that they had the lowest alcohol levels in the tasting with only 13.2% while most of the other wines were over 15%. Made by god knows who. The back label says it is from King City, California which means that it could be a Constellation brand or it could be made at a custom crush facility like The Monterey Wine Company. 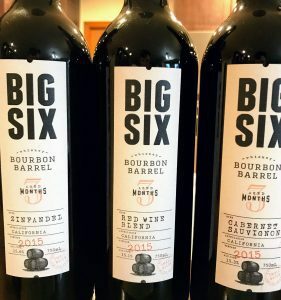 They offer a Cabernet Sauvignon, unknown Red Blend and Zinfandel aged 90 days in bourbon barrels with ABVs ranging from 15.1% (Red blend) to 15.5% (Zinfandel). Made by Ginnie Lambrix at Truett Hurst. While most wines were labeled as multi-regional “California,” this wine is sourced from the more limited Paso Robles AVA. Aged 90 days with a 16.8% ABV. Made by Constellation Brands. A Cabernet Sauvignon aged 90 days and a Chardonnay aged for 60 days with both wines having an ABV of 14.5%. Like the Paso Ranches, these wines were sourced from the more limited Monterrey County region. Got only crickets from them on Twitter as well. Made by Treasury Estates with wine sourced from SE Australia. Unknown red blend that was aged 30 days in rum barrels with 15% ABV. This was the youngest wine featured in the tasting coming from the 2016 vintage. 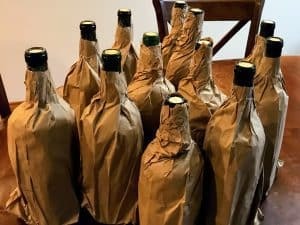 To be as objective as possible, especially with some of the wines like the Cooper & Thief having very distinctive bottles, I brown bagged the wines and had my wife pour the wines in another room. We also “splash decanted” all the wines (except for the Chardonnay) to clear off any reductive notes. 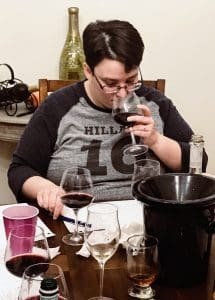 After trying the Chardonnay non-blind, my wife would randomly select an unmarked bag, label it A through L and poured the wines in 6 flights of 2 wines each. We then evaluated the wines and gave each a score on a scale of 1-10. Below is a summary of some of our notes, scores and rankings with the reveal to follow. My friend Pete contributed the colorful “personification” of the wines in his tasting notes. The wine price ranges are from my notes. To keep our palates as fresh as possible we had plenty of water and crackers throughout the tasting. And boy did our poor little spit bucket get a workout, needing to be emptied after every other flight. But even with spitting, it was clear that we were absorbing some of the high alcohol levels. After six reds, we also paused for a break to refresh our palates with some sparkling wine. Baby powder and baking spice. Noticeable Mega-Purple influence. Maybe a Zin or Petite Sirah. Minimal oak influence. Some burnt char. Kind of like the girl you met at the carnival, take for a ride but don’t buy her cotton candy. Drinks like something in the $10-12 range. Many wines were very dark and opaque. Very sweet. Lots of vanilla. Noticeable oak spice and barrel influence. Little rubber. More rye whiskey than bourbon. Taste like oxidize plum wine. Very bitter and diesel fuelish. Reminds me of a Neil Diamond groupie. Drinks like something in the $7-8 range. Smells like a ruby port or Valpolicella ripasso. Some wintergreen mint and spice. Cherry and toasted marshmallow. Noticeable barrel influence. Reminds me of Karen from Mean Girls. Drinks like something in the $10-12 range. Very sweet, almost syrupy. Burnt creme brulee. Burnt rubber. Toasted coconut. Rum soaked cherries. The color is like Hot Topic purple hair dye. Super short finish which is a godsend. If this wine was a person, her name would be Chauncey. Drinks like something in the $5-6 range. Raspberry and vanilla. Graham cracker crust. Not as sweet as others. Very potpourri and floral. Really nice nose! Smells like the Jim Beam. Little Shetland pony earthiness. High heat and noticeable alcohol. Reminds me of the guy who is really ugly but you like him anyways. Drinks like something in the $14-16 range. Toasted marshmallows. Noticeably tannic like a Cab. Raspberry and black currants. Not much barrel influence. This wine seems very robotic. Drinks like something in the $12-14 range. That spit bucket rarely left my side during this tasting. Tons of baking spice. Very noticeable oak. Reminds me of a Paso Zin. Lots of black pepper–makes my nose itch. Slightly sweet vanilla. Most complex nose so far. Would be a delicious wine if it wasn’t so sweet. Reminds me of a Great Depression-era dad. Drinks like a $14-16 wine. Burnt rubber tires. Smells very boozy. Fuel. Taste like really bad Seagram’s 7. Cheap plastic and char like someone set knockoff Crocs shoes on fire. Reminds me of Peter Griffin. Drinks like something in the $7-8 range. Dark fruit and pepper spice. Turkish fig. Juicy acidity. Not as sweet. Round mouthfeel and very smooth. Creamy like butterscotch. Not much barrel influence. Reminds me of a sociopath that you don’t know if they want to cuddle with you or cut your throat. Drinks like something in the $14-16 range. Marshmallow fluff. Caramel. Very sweet. Smells like a crappy Manhattan with a cherry. Seems like a boozy Zin. Not horrible but still bad. Not much barrel influence at all. Reminds me of children. Drinks like a $10-12 wine. Big & rich. Juicy cherries. Sweet but not overly so. Little pepper spice. Very easy drinking. Something I would actually drink. Not much barrel influence. Makes me think of the “I’ve got a Moon Ma” guy. (author’s note: I have no idea what Pete is referring to here. This is my best guess.) Drinks like a $10-12 wine. Stewed plums and burnt rubber. Lots of tannins and acid. The worst thing I’ve had in my mouth all week. Pretty horrible. Long, unpleasant finish. Reminds me of Sloth from The Goonies. Drinks like a $10-12 wine. The closeness in style and rankings of the 3 Big Six wines were surprising. One clear trend that jumped out was that the top three wines had moderate alcohol (13.2% with the Barrelhouse to 14.5% with the Mondavi). Overall these wines tasted better balance and had the least amount of the off-putting burnt rubber and diesel fuel note which tended to come out in the worst performing wines like the Apothic Inferno (15.9%), Cooper & Thief (17%), 1000 Stories Zin (15.6%) and Paso Ranches Zin (16.8%). Another trend that emerged that was similar to the previous tasting (which had the Barrelhouse Red and Mondavi Cab also doing very well) is that the most enjoyable wines were the ones with the least obvious whiskey barrel influence. This was true even with the 2nd place finish of the Stave & Steel that was the wine that spent the most time in the barrel at four months. That is a testament to the skill of the winemaker where the whiskey barrel is used as a supporting character to add some nuance of spice and vanilla instead of taking over the show. Comparing the four months aged Stave & Steel to the two months aged Apothic Inferno is rather startling because even with a shorter amount of barrel time the Apothic seemed to absorb the worst characteristics from the whiskey barrel with the burnt rubber and plastic. The 19 Crimes that only spent 30 days in rum barrels didn’t show much barrel influence at all. It also appears that, in general, Cabernet Sauvignon takes better to the barrel aging compared to Zinfandel. However, the Big Six Zinfandel did reasonably well to earn a 4th place finish. The most challenging task for winemakers is to try and reign in the sweetness. Several of these wines had notes like Wine G (the Big Six red blend that is probably Zin dominant) that they would be decent wines if they were just a bit less sweet. One last take away (which is true of most wines) is that price is not an indicator of quality. Three of the worst performing wines were among the four most expensive with the $17 1000 Stories Zin, $20 Paso Ranches Zin and the $30 Cooper & Thief. The Cooper & Thief tasted so cheap that I pegged it as a $5-6 wine. It is apparent that you are paying for the unique bottle and fancy website with this wine. Only the $17 Stave & Steel that came in 2nd held its own in the tasting to merit its price. 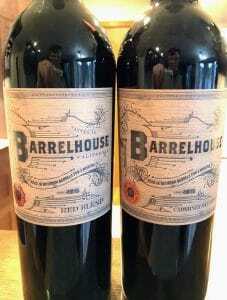 However, the Barrelhouse Red at $13 and Mondavi Cab at $12 offer better value. It’s clear that this trend is not going away anytime soon. If you’re curious, these wines are worth exploring but beware that they vary considerably in style, alcohol and sweetness. Grab a few bottles and form your own opinion. But take my advice and have some good ole fashion real whiskey on standby. 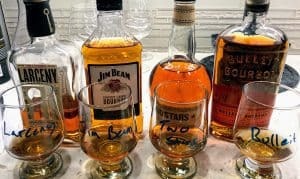 Those “bourbon standards” certainly came in handy after the tasting. Tagged 1000 Stories, 19 Crimes, Almaden, Apothic. Inferno, Australian wine, AW Direct, Barefoot, Barrelhouse, Beam-Suntory, Big Six Wines, Bob Blue, bourbon barrel age, Bruce and Kim Cunningham, Buffalo Trace, Bulleit, Cabernet Sauvignon, California wine, Chardonnay, Concha y Toro, Constellation Brands, Cooper & Thief, Duane Pemberton, E. & J. Gallo, Fetzer, Four Roses, Ginnie Lambrix, Heaven Hill, Jacob's Creek, Jeff Kasavan, Jim Beam, Larceny, Maker's Mark, Marketing gimmick, Merlot, Monterrey County, Paso Ranches, Paso Robles, Petite Sirah, Red Blends, ripasso, Robert Mondavi, ruby port, rum barrel age, Sazerac, Shiraz, Stave & Steel, Syrah, The Federalist, The Monterey Wine Company, The Wine Group, Treasury Estates, Truett-Hurst, Two Stars, Valpolicella, Vendange, Wheated Bourbon, Zinfandel. 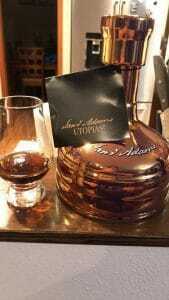 Samuel Adams Utopias 2017– Is it worth the money? It’s Fall which means it is “trophy hunting season” in the beverage world. While bourbon fans are salivating over the release of the Pappy Van Winkle line and Buffalo Trace Antique Collection (BATC), Beer Geeks have been waiting for their own fall time “cult releases” like the Bruery Weekday Stouts, the Goose Island Bourbon County line-up, Deschutes’ The Abyss and Surly Darkness. While there are anticipated beer releases throughout the year, every two years the fall release season gets a special kick with the release of the Sam Adams Utopias. At around $200 for a 750ml bottle, the Utopias is far and away the most expensive of the “cult beers” and the question follows, is it worth the money? First, let’s talk about the 2017 Utopias itself. The 2017 release is a blend of several brews including a batch of Triple Bock that has been aged 24 years, a 17 year aged batch of Millennium, some of the previous releases of Utopias and bit of their Kosmic Mother Funk brew. The assortment of batches are aged in various barrels including bourbon barrels from Buffalo Trace, Ruby Port barrels and white wine barrels from Carcavelos. A unique twist added to the 2017 release is the use of Akvavit barrels which previously held the Scandinavian herbal liqueur that is characterized by their caraway and dill flavors. After blending, the entire batch of the 2017 Utopias was finished in what the Sam Adams’ website described as “Moscat barrels, a wine known for its slightly smoky character”. Since usually Muscat and Moscato wines are not barrel aged–I’m going to take a guess that they are referring to Moscatel from either the Sherry region of Spain or the Portuguese region of Setúbal. Both are fortified wines that are barrel aged and, while “smokey” is not necessarily a primary note in their profiles, can see some subtle barrel influence. The end result of all this work is a mere 13,000 bottles of 28% ABV “beer” that truly deserves the scare quotes around the word. With no carbonation and the ability to be nursed and savored in small pours over many years, it is hard to compare it any other beer. And that’s were the question of Cost and Worth come in…. The peers to the Samuel Adams’ Utopias are not Russian River’s Pliny the Younger, Bell’s Hopslam, Boulevard’s Scotch on Scotch, Alchemist’s Heady Topper or other highly sought after brews that have folks driving for hours, camping outside stores and breweries just get a highly allocated bomber or pack. Rather, it is more apt to compare the Utopias to some of the bourbon trophies–the Pappys, BATC, Michter’s 10 yr Rye, the Orphan Barrels, Four Roses Limited Editions, Old Forester Birthday Bourbon, High West’s A Midwinter’s Night Dram, Elijah Craig 18 & 23 yrs, etc. And make no mistake, while many of these bourbons are tasty drams, for most people acquiring these is far more about the hunt than it is for the innate quality of what is inside the bottle. When something is made in such a limited qualities, the economic laws of supply and demand give way to the human desire for exclusivity and lust for Veblen goods. If only 1,461 bottles of the Eagle Rare 17 was made for the 2017 BATC release then only around 1,461 souls are going to get that “trophy”. How much is it worth to you to be one of those souls? How much is it worth to you be one of the folks who can share that trophy with friends and family? That was my mindset when it came to the Pappy 20 year that I was able to “bag” a couple years ago. I was able to get it for around $230. I tried it and was…well underwhelmed. “Good but not life changing” is the most apt description. It has a very lovely nose–candied apricots, vanilla, orange blossoms and some baking spices. In fact, I would say the nose is the best part. But the mouthfeel and complexity on the palate is just meh. The vanilla (LOTS of vanilla) carried through and takes on a sort of orange creamsicle character. But that’s pretty much it. It has a fair amount of bite and heat for something that is only 45% especially when I compared it to how smooth the Old Pultney 21 and Glenmorangie Signet are at 46%. Last night after I had the Pappy, I tried the Girvan’s Proof Strength Grain Whiskey that was 57% and even that was smoother and more balanced. 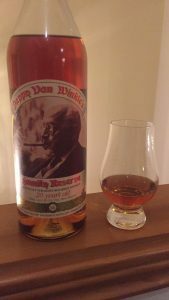 That was over a year ago and even after sharing it very liberally with friends and family, I still have about a third of a bottle of the Pappy 20 left. Even after it is all gone, I honestly don’t see myself going through the effort to hunt for another bottle. Still, I don’t regret getting it or spending the money. It was a trophy and I can say that I’ve experience the success of the hunt at least once in my life. So…..are you trying to say that you were underwhelmed with the Utopias, eh? Actually, no. I quite enjoyed the 2017 Utopias. I was blown away with how much it tasted like a salted caramel–like Fran’s Chocolate level good. From a geeky and foodie perspective, it had my thoughts racing about what kind of interesting and delicious food pairing possibilities that one could do with the interplay of sweet and savory that is very well balance in the brew. The nose smells like a 20 year Tawny Port. Very rich and caramel with spices. The palate is oily and silky. Salt! It totally taste like a salted dark chocolate caramel. Rolling it around your tongue you get a mix of both black cherry and tart red cranberries. There is a toastiness underneath almost like a baked graham cracker crust. It holds it heat fairly well for 28%. You can feel it with the weight and mouthfeel but there really isn’t any back end heat. It was certainly a unique experience and, for me, being one of the 13,000 people that get a chance to experience that uniqueness and share it with friends and family make its worth the price. Will I be rushing to get another bottle when the 2019 release comes out? Maybe. It will honestly all depend on if I still have some of the 2017 left at that time. But that’s me. I can’t answer the question of whether or not it is worth it for you or anyone else. Just like with the trophy bourbons. Some are worth it. Some may not be. But if you like the hunt and want that exclusivity then, by all means, Happy Hunting. Tagged Alchemist Heady Topper, Barrel-Aged, BATC, Bell's Hopslam, Boulevard Scotch on Scotch, Bourbon County, Buffalo Trace, Cult Beer, Deschutes, Elijah Craig, Four Roses, Fran's Chocolate, Girvan, Glenmorangie, Goose Island, High West, Michter, Old Forester, Old Pultney, Orphan Barrel, Pappy Van Winkle, Pliny the Younger, Russian River Brewery, Salted Caramel, Samuel Adams, Signet, Surly, The Bruery, Utopias, Veblen Good.